Indus Valley civilizationArchaeological excavations have brought to light the remains of a highly developed urban civilization in ancient India. 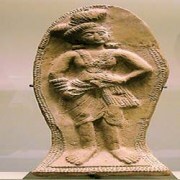 The Indus valley civilization that flourished till 1700 BC was stretched up to 1520 kilometres, extended from the area on the upper Sutlej in contemporary Punjab to Lothal in Gujarat. The most remarkable feature of Indus Valley civilization was a very high degree of urbanization in many of its settlements. However, there is no evidence of monarchy being practiced during that time. 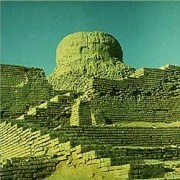 This has led to the conclusion that there was democratic setup of governance during Indus period. The archaeological evidence could not shed any light on the system of governance, except the discovery of some large size structures to suggest, that they may be community halls used for the purpose of governance. The decline of the Indus Valley civilization saw the arrival of the Aryans. From 1700 B.C to around 500 B.C, most of northern India was inhabited and tribal settlements along the Gangetic plains. The increase in population and surplus production provided the bases for the emergence of independent states with fluid territorial boundaries. This led to the formation of rudimentary administrative system headed by tribal chieftains. Some of them transformed a number of such territories into hereditary monarchies. These emergent state governments collected revenue through officials, maintained armies, and built new cities and highways. It’s by 600 B.C., sixteen such territorial powers; including the Magadha, Kosala, Kuru, and Gandhara stretched across the North India plains from modern-day Afghanistan to Bangladesh. Among them the kingdom of Magadh was one of the 16 great janapadas that had established paramountcy over other kingdoms of the Ganges Valley. The fluid political situation, made it possible for Chandragupta Maurya (reign - 322 - 298 B.C.) to lay the foundation of Maurya dynasty. It was under Chandragupta Maurya that some form of political unity was attained. He was assisted by a Brahmin called Vishnugupta, also known as Kautilya or Chanakya, the person who wrote Arthasastra, a treatise on the art of governance. Arthasastra is devoted to the methods of systematically breaking up free, powerful, armed tribes of food producers that had not yet degenerated into absolute kingdoms. The main technique was to soften them up for disintegration from within, to convert the tribesmen into members of class society based upon individual private property. Arthasastra mentions that end has to be clear and the means to attain it needed no justification. There is not the least pretence of morality or altruism in attaining the end. It says, no matter how gruesome and treacherous, the method, it has to be practical, with due consideration to costs and possible effects. Abstract questions of ethics are never raised or discussed in this book. The sole purpose of every action was safety and profit of the state. The Arthasastra recommends espionage and the constant use of agent provocateurs on a massive and universal scale. Murder, poison, subversion was used at need by the king's secret agents, methodically and without a qualm. Kautilya treats strife for the throne as a minor occupational hazard. No regard to morality or filial piety is ever questioned. He quotes a predecessor's axiom; `Princes, like crabs, are father eaters. He introduced the role of Brahmins in the state craft saying the right of a king to his throne, no matter how it was gained, has to be legitimized through elaborate sacrifice rituals and genealogies concocted by priests who ascribed to the king divine or superhuman origins. During the Chandragupta Maurya period the use of absolute power grew even worse under the caste system, which classified people into separate categories on the basis of birth. The most famous king of the Mauryan dynasty was Ashoka the Great. His social philosophy penetrated in the state governance. According to him the king should make a complete tour of inspection throughout his domains every five years. Such a tour must have taken up a good part of the five years, which implies constant traveling except in the rains. Every high administrative official was ordered to make a similar quinquennial tour through the entire territory under his own jurisdiction. In addition, he created a new class of plenipotentiary supervisors with control over officials and special funds. The title was Dharma-mahamatra, or `minister of morality', who was later `senior regulator of charity and religious affairs'. He was to act on the principal of equity that’s beyond formal codified law and common law upon which both law and justice are supposedly based. 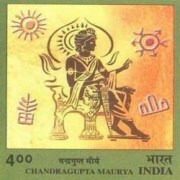 Chandragupta Maurya Ashoka died around 232 B.C. and the empire began to disintegrate under weak successors. In subsequent centuries India suffered a series of invasions, and there were spells of foreign rule in the absence of a h3 central authority. It was Chandragupta II- Samudra Gupta's successor - who re-established a strong central authority and a system of governance. The twilight of the Gupta Empire saw the setting in of decay. There was only a brief glow during the time of Harshavardhan of Kannauj (604 - 647 A.D.) who established a system of governance famous for philanthropy and patronage of Buddhism. The caste system became even more draconian by about the eight century AD, with the introduction of the Law of Manu. The beneficiaries of this model of governance were the upper castes, led by the Brahmin caste. The system known as Brahmanism was a collection of social regulations called `religious rituals' that amounted to the most omprehensive system of repression ever known to mankind. In this system of governance, there was no place for morality, ideas of transparency and accountability. It was only during the medieval period under successive Muslim rulers that a more elaborate structure of governance was developed which was based on the principal of kingship or monarchy rule.